In a significant advance, University of Massachusetts Amherst engineers have established electrical surface treatment of conducting thin films as a physical processing method to reduce surface roughness. 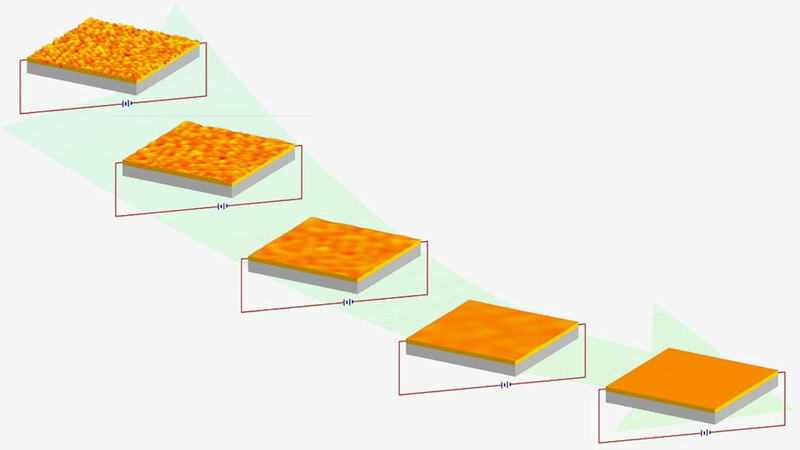 Surface roughness reduction is a really big deal when it comes to fundamental surface physics and while fabricating electronic and optical devices. As transistor dimensions within integrated circuits continue to shrink, smooth metallic lines are required to interconnect these devices. If the surfaces of these tiny metal lines aren’t smooth enough, it substantially reduces their ability to conduct electrical and thermal energy -- decreasing functionality. A group of engineers at the University of Massachusetts Amherst are now reporting an advance this week in Applied Physics Letters ("Current-induced surface roughness reduction in conducting thin films"), from AIP Publishing, in the form of modeling results that establish electrical surface treatment of conducting thin films as a physical processing method for reducing surface roughness. A true irony here is that “electromigration is best known for its damaging effects within metallic interconnects -- underlying crucial materials reliability problems in many generations of microelectronics,” Maroudas said.